I tried my hand to click the night sky at Hail Himalayas this time. 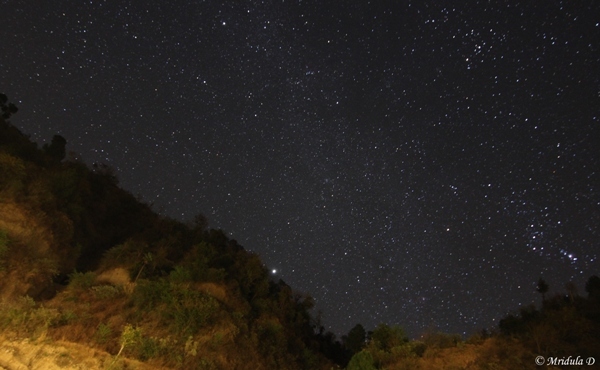 The night sky had about a million more stars at Hail Himalayas than I see in the cities. In the city sometimes I have to search really hard to find even a few stars. I have always been fascinated by the night sky in smaller places but before this trip near Shimla I was never able to click them properly. I started drooling as soon as it became dark and the stars came out. 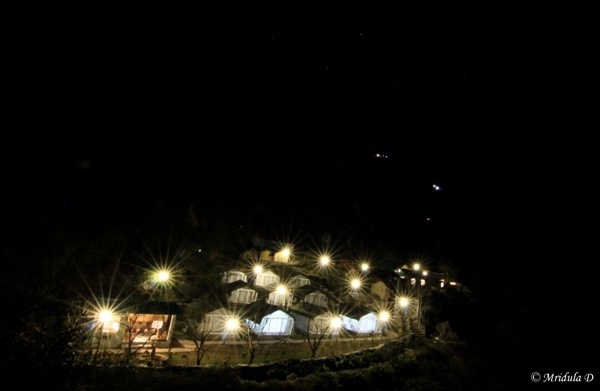 However my first attempt was to click the camp at night. As I said before, Hail Himalayas has tented huts. I wish I was skilled enough to click the night sky along with the tents. But this time I got the tents and the stars separately. It was difficult to be out at night for a long time as it was cold in December in Himachal Pradesh. Everyone at home was apprehensive as to how would I cope with cold. But I managed fine as there was a blower in the tent and they would light a bonfire in the evening. So this is how the camp looked at the night. I was in the second tent of the first row. The bright lights you see are the lamp posts. These were the millions that came out every night while I was there. I was so happy that I could see once again that how beautiful the night sky looks when there are no harsh lights. Now that I have got a basic hang of clicking the night sky, of course I am going to try it out more and more. I clicked many shots but some I took while I stood close to a lamp post. That is not a good strategy. The 2-3 shots that came out well were those where I went and clicked away from any bright source of light. Also, I thought the camera would not catch the electric wires at night. Of course that was stupid reasoning and I was wrong. Can’t wait to get away to other such places where a million and more stars come out at night. Hail Himalayas is a phrase that any mountain lover will identify with. But it is also an adventure camp near Shimla. I spent the last weekend of 2013 with them (on invitation) and I had a great time. On the Chail road as soon as we took the detour to nowhere I knew it was going to be a great trip. They have tented huts at the adventure camp. Now you may ask me if I froze to death in December near Shilma? No, I did not, because my tent had a blower, the bathroom had hot water and there was a tea maker in the room as well. What more one could ask for? Have a look at the video that I made of Hail Himalayas. It was a trip where I went to see sunrise, did a small trek and enjoyed the bonfire, because it was really cold. This was also the trip when I got blue skies in the mountains, finally in 2013. The starry nights were amazing too. Now that I am back in favor with the mountain gods, I hope the luck will continue in 2014 as well. I so like the places which are away from the civilization. I can also do without many comforts. For example when I trek in Nepal, I manage with cold water. For me it is a luxury to have a tea house to stay at and not in dome tents that we would pitch ourselves. I know not everyone is willing to go to great lengths and yet many may yearn for the wilderness experience. In that case Hail Himalayas is a perfect choice. Here you may rough it out during the day but you get back to a tent with attached bathroom and hot water. The room has a comfortable double bed. I would say if you wish to test waters about trekking, do a day trek with them. If you like it, you may try a more adventurous trek later. They offer other activities like rappelling, valley crossing etc within the camp. As I just arrived yesterday night and then straight went to work, the detailed posts will follow. In the meanwhile enjoy the video.